12 MONTH WARRANTY: From the date of purchase, 30 days return free and 12 months warranty. Add to cart to enjoy virtual world! First I will say that while yes this system does say it is for Samsung phones it did not work to do “actual” virtual reality for our phones. What did work however was the YouTube versions of VR where they have the roller coaster and other types of video material. The quality is amazing, but we really could not do a full review because our phones do not support Google Cardboard which I was unaware of when this product first came out. The comfort level of this headset is great and the price is very reasonable considering what you are getting. The ear pieces for earphone setup is top of the line and the ease of connecting it into your jack is the best part. My husband used this for quite a bit testing out the features with the YouTube videos and he really loved it. While we are awaiting a phone upgrade (in January) this is how the product will be used, but best believe that as soon as he can get the upgrade I am going to be coming back for a full review. For $34.00 (also an Amazon Prime product so you know what that means!!) 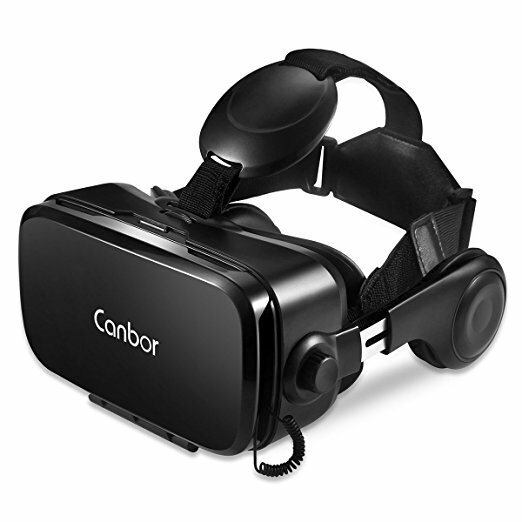 you can grab the Canbor Virtual Reality Headset for yourself or a family member this Christmas season as we know this is one of the hottest gifts right now for both young and old alike. Be sure to check out our 2017 Holiday Gift Guide for more amazing gift ideas!